A gentle practice of static and flowing sequences, with elements of breath modification (pranayama), meditation, and self-study using the body as a laboratory. Suited for all levels, this flow class aims to link breath with movement and re-energize you. This moderately paced, flowing class synchronizes breath with movement. It alternates between dynamic movements in basic and intermediate postures and sinking deeper into still poses. 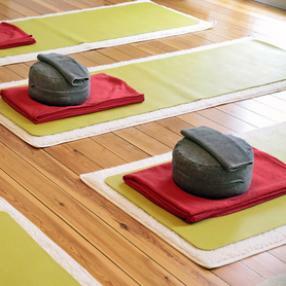 A guided deep relaxation concludes the class and leads you to a place of complete relaxation. Great for all levels and due to the tempo, it is appropriate for beginners as well as intermediate practitioners.